ÅF has the main contract with Trafikverket (the Swedish Transport Administration) and Kreera is their subcontractor in the Maland project (outside the town of Sundsvall). 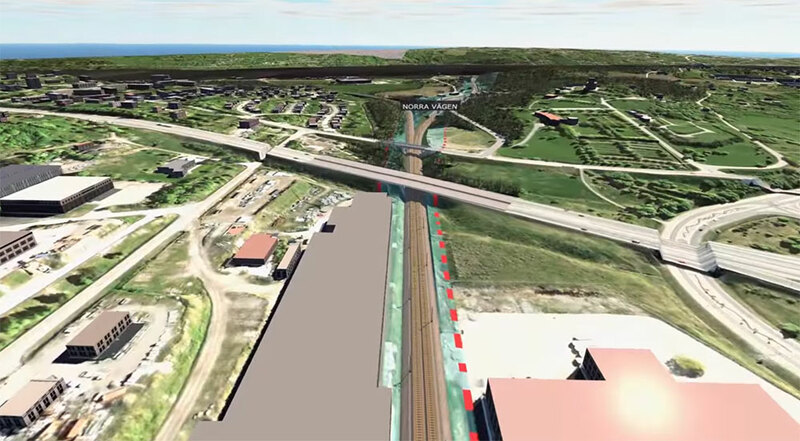 Trafikverket plans to build a new double-track railway connection between the Tunadal track and the Ådal railway line, plus modernizing the Tunadal track. The new rail connection will make it possible to move freight away from roads to rail, leading to major environmental benefits and growth in the Sundsvall region. ÅF's assignment is to design the meeting track triangle at Maland and the upgrading of the Tunadals track, including railway plans, system documents as well as construction documents. “The project is divided into three parts, and we are now starting the detail design of the first part which is about upgrading and construction of a new rail meeting track in Birsta,” says Tobias Johansson. He is a road and terrain engineer at ÅF Infrastructure AB, and is in charge of the public roads in the project. The engineers import the actual rail track line as LandXML files from another tool into Novapoint Railway and Quadri. Kreera then uses Novapoint to design the rail groundwork and terrain under and around the track, as well as designing service roads and depots. “This way we get a complete and always updated model that all stakeholders can share and relate to. Which is the very point of using Quadri,” says Tobias Johansson. Johan Malmström is a terrain and railway engineer at Kreera Samhällsbyggnad AB, a young Malmö-based engineering consulting company with 13 employees. In the Maland project his job is the design and engineering of the actual railroad and the terrain surrounding it. "This way, we can faster discover things that are incorrect and mistakes being done, and then make improvements," adds Johan Malmström at Kreera. “Everything becomes more graphic and clear. In the traditional 2D way, it may take a week to get coordinated feedback on what you have done. If the model is shared well, this way of engineering goes much faster and becomes more confident. In addition you may put in other objects in the model, such as existing drainage, houses and other building structures – which also becomes a visual strength in the further design. The fact that the project team is spread geographically in Malmö, Gävle and Sundsvall is not a problem for the engineers. They communicate well both through the Quadri model in the Cloud and via Skype. The need for physical meetings is reduced to a minimum. Another fact that also is special about this project is that they have a very short time to work out the construction documents. In 2018 the construction will start. So now is the time for detailed design for ÅF´s and Kreera´s engineers.